We all have a passion. For me it’s sailing. Few things in life give me greater pleasure than sailing “hither and yon” on a self-contained yacht. Unfortunately, I’m a little short of cash to own a cruising sailboat. Instead, I fulfill my passion by chartering a boat a week or two each year for a sailing holiday. After more than 25 years of chartering, I’ve learned a few things about choosing a charter company and checking out my boat. In addition to my own experiences, I conducted a survey of charter companies and borrowed freely from their feedback to write this article. So read on if you share my passion and if you want to ensure that your next sailing holiday is carefree. One of the first decisions to make, after you decide you want to go sailing, is whether you want to be the skipper. Of course, being the skipper means you have to know how to sail! Before you can rent a boat, a charter company will ask you for your “sailing resume.” Both for your safety and the safety of their yachts, a charter company wants you to be well qualified. They are looking for several years of well-rounded sailing experience in boats of the approximate size you intend to charter. Satisfactory completion of recognized boating courses is helpful, knowledge and experience in navigating and anchoring procedures are essential. Especially important in coastal sailing is knowing how tides and currents affect a small boat. Many companies will ask you to verify your skills in a brief “demonstration cruise” on the first day of your charter. And they reserve the right to put a captain aboard (at your expense) for a day or two if you flunk the demo! Let’s say you passed your demo, the company signs over the yacht, and off you go. This option is called “bareboating,” meaning that you are responsible for the safe operation of the vessel. While I enjoy being in charge of an expensive yacht, many competent sailors do not. They would much prefer to just go along for the ride, helping out occasionally whenever they like — a laid back kind of holiday! These folks charter a yacht and pay extra for the crew, commonly know as a “crewed yacht.” Generally, these are private boats, run by a captain and cook. Crew quarters are separate and the boats are larger and more luxurious. 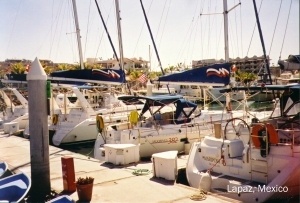 Many are air-conditioned and offer water skiing, scuba diving, or sailing instruction. Food is usually excellent and geared to your preferences. Where you go and how long you stay are choices you make in consultation with your captain. A crewed yacht is a lot like a luxury hotel afloat, offering all the fun and excitement of a new harbor, beach, or village every day and best of all — worry-free cruising. An in-between option is sailing as part of a “flotilla,” which is a group of yachts, perhaps a half dozen or more, all going the same place at the same time. As a skipper you won’t need to have as much sailing experience as required for bareboating on your own, since the flotilla leader is always nearby to provide nautical advice. Flotilla sailing is one way to gain the experience that you’ll need for your resume if you eventually intend to bareboat. Some charter companies offer only bareboats, others offer only crewed yachts, while still others offer both. 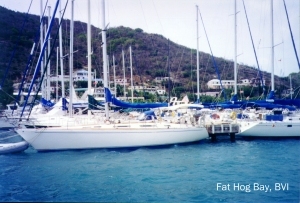 A few companies in selected locations, such as Greece and the British Virgin Islands, offer flotilla sailing. After deciding which type of sailing holiday you want, you then have to decide whether to contact a charter company directly or go through a broker. A yacht-charter broker will help you find a suitable boat by contacting various charter companies in your intended sailing area. They make their living off commissions from the charter companies at no extra expense to you. The advantage of going through a broker is that they do all the work and you reap all the benefits. A competent broker will want to be knowledgeable about you and your needs so be prepared to provide lots of information: When and where will the charter occur? How many people? Will there be children? Is price a consideration? Do you prefer mostly sailing or sightseeing? Will you eat primarily aboard or ashore? What experience do you and your crew have? With over 200 brokerage firms around the world, some are going to be better than others. Here are some questions you can ask to help you find the better ones: Ask if they are knowledgeable about charter companies in the area that you are visiting. They should be familiar not only with the area, but also with the yachts and staff at each company. Ask if they would provide a few references from previous clients who have used their services. Ask if they have an alliance with either the American Yacht Charter Association or the Charter Yacht Brokers Association. If overseas, they should be connected with a national group such as the Mediterranean Yacht Brokers Association. And most importantly, ask if they love sailing and whether they are truly concerned with your sailing-holiday experience. If they answer “yes’ to all these questions, tell them to get busy locating the perfect yacht to meet your needs — a good broker can save you a lot of time and grief. One brokerage company in Massachusetts has as its motto; “the fun begins the minute you call us!” It’s your holiday — if you’re not having fun, you may have picked the wrong broker. Instead of going through a broker, you may want to contact a charter company directly. These can be located in various boating magazines or on the internet. For example, “Sail the Net” provides a comparison of various companies. In choosing a company, a number of factors should be considered. An established history of 15 years or more is a good indication that the company is doing something right. This history allows staff to anticipate problems and prevent them from occurring. They will likely have systems in place to quickly and competently handle most situations such as switching your party to another boat of the same type if problems cannot be rectified, and having chase boats to service disabled yachts. You may want to ask if these services are available from the company. Another factor to consider is the age of their yachts. Usually, but not always, boats which have been chartered for more than five years have more problems. Of course, the newer boats are usually more expensive. If price is no object, go newer. Cheaper is not always the best value but you can usually shop around and find an affordable yacht that has been well maintained. To do so, you’ll need to ask questions about their maintenance schedules and the condition of the yacht you plan to charter. Don’t be afraid to ask for references from previous clients who have chartered that particular yacht. In some sailing areas such as the British Virgin Islands, the number of charter companies is quite large. Some companies have over 20 yachts while others have one or two. And each year, some new companies pop up and a few go belly up! Be very careful with a new company (less than 10 years old) that has just one or two boats. They can be here today (when you pay your fees) and gone tomorrow (when you’re standing on the dock searching for your boat)! I had a bad experience with a one-boat company in Ontario. Even though I returned the boat in good condition, they kept my $1000 security deposit for almost a year after our sailing holiday. I had to threaten a lawsuit to get it back. On the other hand, I also chartered from a one-boat company in Greece and everything went well. The boat was clean, well maintained, and they returned my deposit with a “Thank You” card. One hint as to the quality of a charter company is the extent of their advertising (as bad as that sounds). If a company can afford to advertise month after month, often with large ads that change regularly, chances are it is because they offer a good product at a good price. Their product is patronized and re-patronized to a fairly high capacity, which in turn allows the company to continue to advertise. It is the law of the economic jungle — the strongest and best survive and prosper. Another factor to consider is based on the kind of amenities you want from the company. Do you want showers ashore, swimming pool, fax machine, wi-fi, restaurant, hotel accommodations, or travel service? Regarding hotel accommodations and travel, many charter companies (and brokers) can get you lower prices than going through your local travel agent. Some charter companies will also arrange provisioning of food and drinks for a fee. If you decide to provision yourself, you should ask whether a well-stocked supermarket is located close to the marina (see below for a sample Shopping List). Finally, a big factor is staff attitude. Are they helpful and do they go beyond the basic service? Are they knowledgeable about the sailing area — where to go, what to do, what to bring? Do they give you a ride from the airport and a friendly greeting upon arrival? In Greece, we had a couple of bottles of wine waiting for us in the galley (I really should go back there soon!). Do staff give you a thorough boat orientation and chart briefing or do they give the impression they have better things to do? Obviously, prior to your charter you won’t know the attitude of staff. This can best be determined by talking to previous clients, so ask for a few references and find out if they would return to charter with the company again. Once you (or your broker) have decided on a charter company, you’re well on your way to ensuring a successful sailing holiday. 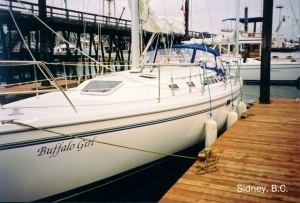 The next steps are choosing the right boat and checking it out. As I mentioned, the reason brokers ask so many questions is to ensure they obtain a boat that meets your needs. Four gung-ho guys, who love to sail and can survive on pretzels and beer, are going to want a different-type boat than two couples who enjoy relaxing, reading, and eating gourmet meals. The guys are going on a sailing holiday; the couples are taking a holiday on a sailboat. Whatever type you select — performance or luxury, catamaran or mono-hull — try to ensure there is a separate bunk and personal space for everyone. Using the salon as Uncle Walter’s sleeping quarters may not make for a great holiday, especially if Walter wants to sleep and the rest of you want to party! Also, the expression “two heads are better than one” really applies on a sailboat where privacy is scarce. Many boaters place “separate heads” at the top of their priority list. And don’t cram too many people onto one boat; overcrowding will strain even the closest friendships. Then again, don’t select a boat that is too big for your party or your level of experience. You will stress the crew and not enjoy your time underway. Worse, you might injure a crewmember or damage the yacht. Make sure the boat has equipment that is important to you. For example, does it have a BBQ, microwave, blender, CD player, GPS, autopilot, or snorkel gear? What about an electric windless, roller furling sails, and self-tailing winches? 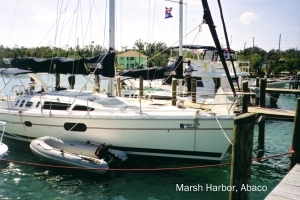 Does it have a Bimini to protect you from the sun, a necessity in southern latitudes? Does it have a tiller and outboard engine or a steering wheel and more powerful inboard engine? Does it have an on-deck shower for rinsing off salt water? Does it come with binoculars and a hand-held compass (our last charter did not)? Will towels and bedding be provided as part of the charter fee or will you have to pay extra or bring them from home? What is supplied for the galley in terms of cleaning supplies, dish cloths, garbage bags, clothespins, or a corkscrew? Asking the right questions will go a long way in choosing the right boat. But even the “right boat,” equipped with everything you’ll need and want, may be the wrong boat if it is a floating wreck. Selecting a yacht that meets your needs is usually done long distance; that is, sight unseen except possibly for a picture and schematic of the layout. Once you get to the marina, the charter company will give you an orientation to your boat’s equipment and systems (usually early on the first day of your charter). This is your opportunity to make sure the boat looks good, smells good, and is in seaworthy condition. Lift the floorboards, is the bilge clean and dry? Is there a diesel or gas smell? Does the head or holding tank smell? Is everything in working order — the stove, fridge, bilge pump, head (especially the head! ), lights, depth sounder, compass, wind-direction indicator, VHF radio, etc? Are the marine batteries less than five years old and well charged? Is this a boat you would go to sea in? If not, do NOT accept the yacht. Ask them to remedy your concerns. Remember, your holiday should be the charter company’s only focus; this is what they do for a living. Check out the dinghy that comes with the yacht. Does it leak (water or air)? Is it big enough to accommodate your crew? Will you want an outboard or will paddles suffice? Many charter companies today are supplying rigid-hulled inflatables — these are usually more comfortable and secure than a wooden or fiberglass dinghy, especially in rough water. Of course, you’ll want to check out the condition of the sails — the newer the better. Certainly if there are signs of wear and tear, ask the company for a replacement or at least point it out to them so you won’t have to pay for a repair job if they rip. While you’re at it, check out the winches, winch handles, sheets, and lines that come with the boat. A long (150′) line for tying off the stern to shore will be useful when anchoring in crowded harbors. And make sure there are sufficient fenders to prevent scratches when docking. Actually, a “demo cruise,” although somewhat intimidating to the less-experienced sailor, is an excellent opportunity for you to check out the sails, rigging, and other systems, such as the knotmeter, autopilot, and GPS, which can’t be checked at the dock. Make sure you know the range of your sailing area and whether the appropriate charts and navigational tools are on board. A “Cruising Guide” which provides pictures and detailed descriptions of ports, anchorages, and hazards is very useful. Try on the Personal Flotation Devices (PFD’s), at least one for each person, to ensure they fit, especially if children are on board. Know where the first-aid kit, sound device (horn, bell, or whistle) and signal flares are kept. See whether you can deploy the life preserver quickly in the event someone falls overboard (sometimes these are tied on to prevent their loss — not a good idea). Is the primary anchor securely fastened to the bow and the bitter end tied off? Is there a second anchor with sufficient chain and rode to double anchor if required? Where are the fire extinguishers located and are they charged and ready to use? Is there a safety harness on board, which is particularly important in rough weather when crew may have to go up on the foredeck? Is there a boat hook? What about tools? I can almost guarantee that you’re not going to complete a week of sailing without using at least a screwdriver, pliers, or duct tape! A flashlight with spare batteries is essential, especially if you plan to go ashore at night. Are there fans or wind scoops if you’re lucky enough to be someplace warm? And are there screens for the hatches? Nothing ruins a good night’s sleep like a boatload of mosquitoes! Gosh, so many questions and so little time (the average boat orientation takes about an hour and a half)! The point is, whenever possible, you’ll want to avoid learning by experience on your sailing holiday as I did when an old worn jib ripped in moderate winds and cost me $200 of my deposit, or when the icebox drain was plugged and our food floated in melt water, or when the starboard winch wasn’t working and we had to do a lot of serious luffing to set the jib, or when we didn’t have a long enough line to tie off our stern to shore and had to tie all our docking lines together, or when the electric bilge pump didn’t work and we had to manually pump out 20 gallons of water daily because the packing gland leaked, or when the primary anchor, chain, and 160 feet of rode all went into the drink because it wasn’t tied off at the bitter end, or when …. well, I’m sure you get my drift. After many years of fixing problems on my sailing holidays, I’ve come to one conclusion: good judgement comes from experience; and a lot of that comes from bad judgement! So, if you have a passion for repairing boats, choose any charter company, any boat, and cast off. However, if you have a passion for carefree sailing, keep this article handy when planning your next sailing holiday. The author would like to thank the following brokers and charter companies who responded to his Survey and gave permission to share their feedback. Now that you’ve checked out your boat, it’s time to go shopping for provisions (also known as “groceries”). Here is a Grocery List which you may want to use, so you don’t forget anything. Before shopping, check what is already on board. BEVERAGES Beer ! Coffee ! Tea ! Bottled Water ! Juice ! Soft Drinks ! Wine ! Liquor ! VEGETABLES Broccoli ! Lettuce ! Potatoes ! Carrots ! Cauliflower ! Celery ! Mushrooms ! Onions ! Peppers ! Radishes ! Spinach ! Tomatoes ! Cucumbers ! SNACKS Nuts ! Potato Chips ! Cookies ! Tortilla Chips ! Raisins ! Power Bars ! FRUIT Apples ! Bananas ! Berries ! Grapefruit ! Grapes ! Lemons ! Limes ! Melons ! Oranges ! Pears ! CANNED GOODS Applesauce ! Soup ! Stewed Tomatoes ! Tomato Paste ! Spaghetti Sauce ! Lentils/Peas ! Tuna ! Beans ! CONDIMENTS Peanut Butter ! Syrup ! Jelly/Jam ! Ketchup ! Mustard ! Chili ! Mayonnaise ! Garlic ! Pickles ! Relish ! Salsa ! Salad Dressing ! Soy Sauce ! Honey ! Salt ! Pepper ! Spices ! Sugar ! DAIRY Milk ! Eggs ! Butter or Margarine ! Sour Cream ! Whipped Cream ! Yogurt ! Cottage Cheese ! Cream Cheese ! Parmesan Cheese ! Sliced Cheese ! MEAT, FISH & POULTRY Hot Dogs ! Hamburgers ! Bacon ! Sausage ! Deli Meat ! Chicken ! Turkey ! Beef ! Pork ! Ham ! Fish ! Shellfish ! BAKERY Bread ! Bagels ! Buns ! English Muffins ! Frozen Waffles ! Frozen Pizza ! LAUNDRY Detergent ! Fabric Softener ! Stain Remover ! KITCHEN Cooking Oil ! Dish Detergent ! SOS Pads ! Napkins ! Paper Towels ! Aluminum Foil ! Plastic Wrap ! Garbage Bags ! DRY GOODS Cereal ! Oatmeal ! Crackers ! Pasta/Noodles ! Pancake Mix ! Rice ! BAKING GOODS Flour ! Baking Soda ! Baking Powder ! Cake Mix ! Cocoa ! Bread Crumbs ! Vanilla ! BATHROOM All Purpose Cleaner ! Bath Soap ! Deodorant ! Lotion ! Razor ! Shaving Cream ! Shampoo ! Facial Tissues ! Toothbrush/Paste ! Toilet Tissue (bio-degradable) ! MISCELLANEOUS Bandages ! Batteries ! Lunch Bags ! Candles ! Pet food ! Stamps ! Vitamins !